Wiccans and Psychic and Spiritual Protection? A reader asked me: What are some of the quickest, easiest ways for psychic & spiritual protection? Sigils are magickal symbols that hold an intention. You create a sigil by using the following simple process. First, write out your desire on a scratch piece of paper; you can use a single word or a phrase. To keep this example simple and clear, I’ll just use the word “success.” Cross off all of the repeated letters in Success. You end up with S, U, C, and E. (You want only one of each letter that appears in the word.) Next, scramble the letters, getting S, E, U, and C (for example). Now comes the fun part: Combine the letters together in an image. Wear a necklace of hematite and amethyst. The hematite grounds you, and the amethyst turns all energy into white light. Ritual bathing can be a great way to get rid of the nasties that may cling onto your aura. Bless and consecrate your soap and shampoo. Set these aside for use only during your ritual baths. Use a stocking or cotton cloth, and place inside selected cleansing herbs. The total amount of all herbs will be one tablespoon. If you use a cotton cloth, gather the corners and tie them with a string. Make sure the sachet is closed and secure. This keeps the herbs from clogging your drain. Place your sachet in the bath water then sprinkle in some sea salt and let steep for 5 or so minutes. Then enjoy. May these three protection methods bring you comfort. Imagine putting a magical intention into an object. Why would you do that? Wiccans do this because they want the object to hold power to help them realize a personal desire. For example, you may be job hunting and you want the power of the object—in this case, a sigil—to assist you to get the ideal job. Making your own personal sigils is easy. Some time ago, author/artist Austin Osman Spare devised a method for creating sigils. Since that time, a number of authors have discussed Austin Osman Spare’s process of making sigils. One book I appreciate is Frater U. D.’s Practical Sigil Magic: Creating Personal Symbols for Success. I have made a couple of my own additions to the process. First, throughout history, witches made sigils out of virgin parchment. But that is quite expensive. Also if you’re vegan and will not wear leather, you will want to use something else. Why? Parchment is typically made from goat skin. So let’s talk about a process devoid of parchment. I use the heavier art paper, the kind that absorbs ink and which can be infused with different tinctures made with herbs. Water color paper is a nice choice, too. What about inks? You could use one or of the many magickal inks on the market. My favorite is Dragons Blood Ink. But magickal inks can be expensive. So you can make your own out of a high grade ink such as Winsor Newton ink or India ink. To make it a magickal ink just add some essential oil to it, like myrrh. Mix and consecrate. You can even use Sharpie pens as author Peter Paddon suggests. Just make sure to designate specific pens for only magickal work. They’ll be part of your set of magickal tools. We’ll now use the word “Success” as our example. Cross off all of the repeat letters in Success. You end up with S, U, C, and E. (You want only one of each letter that appears in the word.) Next, scramble the letters, getting S, E, U, and C (for example). Now comes the fun part: Combine the letters together in an image. Can you find the letters? In this way you can make all sorts of sigils. If you want to imbue it with a potion or tincture this is the time to do it. You can either soak the paper in your tincture or brush it on. Either way you must let it dry. Overnight is best. Now with this new image (of combined letters), inscribe it with your magical ink on your absorbent paper. Now that you have the sigil, the next step is to breath life into it with Pranic Breathing, also known as belly breathing. If you’re familiar with yoga, you are probably familiar with Pranic Breathing techniques. Breathe in deeply; allow your stomach to inflate. Visualize pulling up energy from the earth. When you have built up enough energy in your lungs, blow it onto the sigil. This will charge it with your energy and further empower your intention. Now place your sigil in a safe place and forget about it. Forgetting about it is the toughest part of the whole process. This helps the magick work. 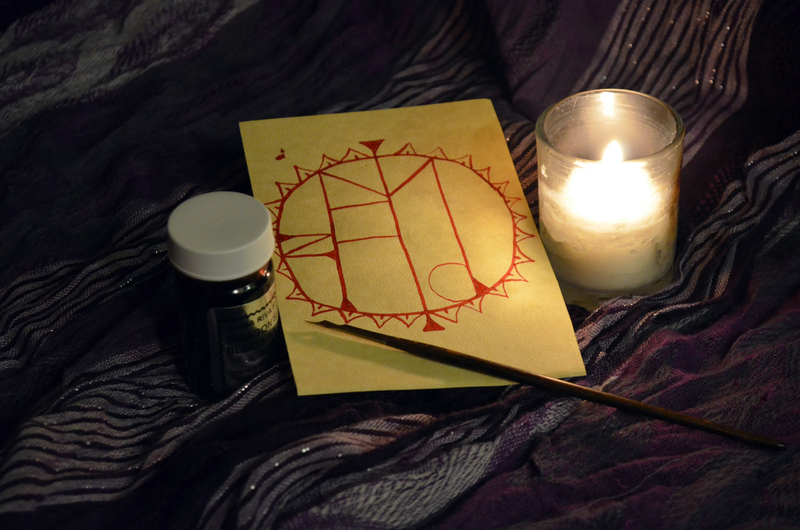 As you can see, making your own sigils is quite easy and fun. After some practice, you will be able to do them quickly and easily. Remember to consider using sigils to further your goals and get what you really want. My workbook has just come out with a second expanded edition. You can check it out HERE .